As an early Halloween treat, we’re pleased to bring you The Zombie Connection. The song was originally written and recorded at Dragon*Con 2009 in about 30 minutes. Tim and Kim agreed to record clean versions of their parts and let me wrap other instruments and sound effects around them. Win a PPD Hardsuit Costume Token! 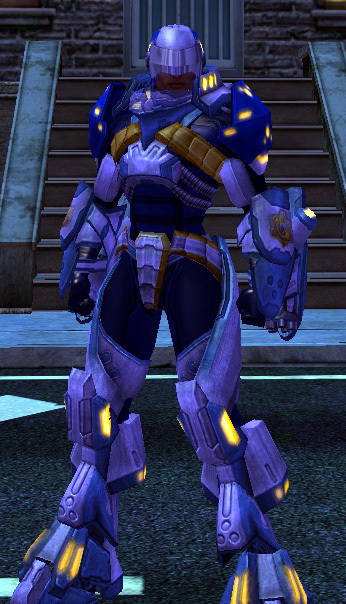 Enter our random drawing to win a PPD Hardsuit Costume Code from The COH Podcast! These were given out at the NCSoft booth at PAX ’08 and we have acquired extra codes for you to win! Simply send an email to cohpodcast@gmail.com with ‘PPD Hardsuit Contest’ in the subject line. The deadline is Midnight, September 27, 2008. Drawing on September 28, 2008 and the winners will be notified via email after announcement on the episode is made. We are asking that entries come from those over 18 years of age. He likes Pallas. He likes who he is when he experiences her life out of her eyes. And now he looks through her eyes at his own sleeping brown face as she peers at him through the crystal porthole in his stasis chamber. After twenty years, Parasite will wake up. Don’t forget to purchase the print edition of Playing For Keeps from Amazon.com on Monday, August 25, 2008 !! If you’d like to buy a copy its important to wait until that date to help push it up the Amazon charts enabling higher visibility of this awesome book! And don’t forget to enter our contest to win a signed copy of the novel!! But you gotta hurry- we need to receive your e-mail w/ name, address, and age (over 18, please) by midnight tonight (5/23/2008)! !